Opera Holland Park's Christine Collins Young Artists scheme not only allows young singers, conductors and directors to work with the company, but provides a showcase performance based on one of the main productions. This year the Christine Collins Young Artists performance was Delibes' Lakme, based on the production by Aylin Bozok, designed by Morgan Large with lighting by Howard Hudson. 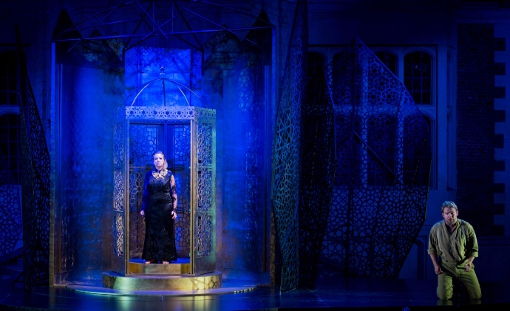 From the main production, Fflur Wyn played Lakme and Robert Murray played Gerald, and they were joined by young artists Frederick Long as Nikantha, Adam Gilbert as Frederic, Sophie Dicks as Mallika, Rachael Brimley as Ellen, Rosie Middleton as Rose, Laura Zigmantaite as Mrs Bentson and Dominick Felix as Hadji. The Associate Director was John Wilkie and the conductor was Holly Mathieson. The success of the Christine Collins Young Artists scheme can be judged from the way so many of the performers in this year's Opera Holland Park season are alumni of the scheme. I remember talking to Christine in 2013 and she was keen not just to support young artists by giving them tiny roles and cover jobs, but to give them a moment when they could step up and really show what they could do. She died in 2014, and this scheme is her remarkable legacy. Leo Delibes (1836-1891) was a Paris based composer who had trained at the Paris Conservatoire with Adolphe Adam. Delibes composed operas, operettas and ballets but is known today for his ballet scores, Coppelia and Sylvia and his last opera Lakme. Lakme was premiered in 1883 at the Opera Comique and was intended, from the outset, as a showpiece for a coloratura soprano. It partakes of the fashionable atmosphere of Orientalism already explored in Bizet's Les Pecheurs de Perles (1863) and Massenet's Le Roi de Lahore (1877). But adds to this an interesting commentary on British Imperialism. Delibes was a contemporary of both Bizet and Massenet, but his music has neither the earthy directness of Bizet nor the really lush romanticism of Massenet. Instead Delibes offers a finely scored elegance, coupled with a slight old fashioned attitude to dramaturgy. What keeps the opera on the fringes of the repertoire is his melodic ability. Not just the Bell Song, the coloratura show piece beloved of sopranos, but many of the other arias and ensembles. The work is stuffed with good tunes, yet has a certain edge to it because of the interesting way the British are depicted; they are simply not very nice, being completely uncomfortable in India. The plot involves a Brahmin priest, Nilakantha (Frederic Long) who practises in secret with his followers, opposing the British imperialists. He has turned his daughter Lakme (Fflur Wyn) into a semi-divine being, supported by her servants Hadji (Dominick Felix) and Mallika (Sophie Dicks). A group of British people, two officers, Frederic (Adam Gilbert) and Gerald (Robert Murray), Gerald's fiancee Ellen (Rachael Brimley) and her sister (Rosie Middleton) and their governess Mrs Bentson (Laura Zigmantaite) come across Nilakantha's temple when out wandering. The others leave but Gerald stays behind, bumps into Lakme and falls in love. Act Two is set in the market place. The British group are there and are unhappy with the noise and bustle, Nilakantha and Lakme are there in disguise, he forces her to sing the Bell Song and it attracts Gerald's attention. Gerald manages to talk to Lakme and she begs him to become a Hindu, the act finishes with Nilakantha attacking Gerald. In Act Three, a recovered Gerald and Lakme are living hidden. Found by Frederic, Gerald is exhorted to rejoin his regiment. Lakme despairs and drinks poison, but persuades Gerald to drink from the same sacred cup as her so the two will be forever linked. When Nilakantha arrives he can do nothing. The Swiss-Turkish Aylin Bozok has made a name for herself with a series of small scale productions at the Grimeborn Festival including Debussy's Pelleas et Melisande (see my review) and Massenet's Werther (see my review). Here, working on a far larger scale, she showed the same interest in creating an abstract meditation on the work rather than addressing themes directly. For the setting Morgan Large had created a glorious gilded pavilion with curving lotus-like screens which could shield it or open to reveal the gilded interior. This formed the centre-piece for all the action. Costumes for the Indians were vaguely exotic without being too specific, but I did think that the gowns for Fflur Wyn as Lakme were a little too like mid 20th century cocktail gowns rather than a 19th century Indian goddess. The production was full of extra action and significant mime, creating a sort of parallel to the music. From the first notes of the overture, we saw Sophie Dicks (Mallika) and Dominick Felix (Hadji) who were engaged in what I might term significant actions. The problem, for me, was that throughout the production I could not quite fathom the significance of the stage action when it departed from the stage directions. Essentially it became a series of interesting and evocative stage pictures. This worked very well in the outer acts where there was little narrative action and a concentration on the interaction between the protagonists. Aylin Bozok's direction, reflected by associate director John Wilkie, brought out the individual performances and reflected the characters' emotional states. But in the middle act, with no sense of narrative and no attempt to create a market place, the action became an abstract attempt to show the characters state of mind and frankly things sagged very badly. A dancer, Lucy Starkey, introduced during the ballet sequence was kept on stage and seemed to form a parallel with Fflur Wyn's Lakme. The presence of the dancer during the Bell Song seemed vastly redundant and seemed to reflect a lack of faith in the singer's ability to convey everything the director wanted. For the rest of the opera, Lucy Starkey was present rather too often. But whatever the director and the rest of the cast do, Lakme stands or falls by on the performance of the lead role. Fflur Wyn sang with coloratura brilliance and a lovely lyric feel for Delibes' flexible vocal line. All the notes of the Bell Song were there with crystalline beauty, but what was impressive was the way that Fflur Wyn used them, as here and elsewhere her singing was very expressive. Her voice is no little-girl voice, she has a rich lyric instrument which carries above the stave and her account of Lakme seemed effortless. What we carried away was a profoundly affecting performance. Fflur Wyn was ably supported by Robert Murray's solid, yet troubled Gerald. French opera of the period requires a lyric flexibility from tenors, but also a degree of power and stamina. Robert Murray brought all of these. Whilst his voice did not sound ideally relaxed above the stave, he was always flexibly expressive and sang with beautifully even and solid tone. His Gerald was good hearted but probably not the brightest button in the box (few 19th century operatic heroes are!). The drama rests quite considerably on Gerald as it is he who starts it and then causes the ebbing and flowing of dramatic tension. Here Robert Murray was entirely believable, and duetted beautifully with Fflur Wyn. The director made a neat use of their difference in stature so that that British Imperialist seemed to, at times, loom over the small Indian girl. The remaining cast each get their moment, and the young artists were all nicely paced and showed well in their moment of glory. Frederick Long has a lovely, grainy baritone voice and sang Nilakantha with a lovely sense of line. He had not quite learned to be threatening without veering into ham, but this was a very impressive debut. Sophie Dicks made a strong, no-nonsense Mallika. She has quite a robust voice, but one which had the flexibility and subtlety to blend well with Fflur Wyn in the Act One, Flower Duet. Dominick Felix as Hadji had rather less to sing, but the stage action made great use of him so that we came to appreciate his solidity of presence. The two English girls are rather written as a pair, we only ever see them together, and the singers have very little time to make a mark. Rachael Brimley and Rosie Middleton looked like sisters and formed a lovely double act, impressing with the cool beauty of their presence. Despite her vocal poise Rachael Brimley never quite brought a sense of distinct character to her role. Rosie Middleton managed to bring a crisp sense of personality to Rose, especially in her exchanges with Frederic. Adam Gilbert as Frederic was very much the British soldier, solid and unquestioning and not a little thick (you sensed that he would always come off worse in exchanges with Rose). The production placed lot on Laura Zigmantaite as Mrs Bentson, and Act Two seemed to be partly done as her nightmare. Laura Zigmantaite did not disappoint, she sang the role neatly and brought a vividness to all the extra action. It cannot be easy rehearsing someone else's production whilst that production is still being created, but John Wilkie marshalled his forces well and drew some strong performances from the young artists. In the pit, Holly Mathieson conducted a brisk and dramatic account of the score, but one which let Delibes melodies flow and she drew some richly lyrical playing from the City of London Sinfonia.